Partly cloudy in the morning then becoming cloudy with periods of rain later in the day. High 71F. Winds SW at less than 5 mph, becoming NW and increasing to 10 to 20 mph. Chance of rain 80%..
Light rain early. Partial clearing late. Low around 45F. Winds NNW at 10 to 20 mph. Chance of rain 90%. JANESVILLE — Students in Janesville will have a new way to read this summer. 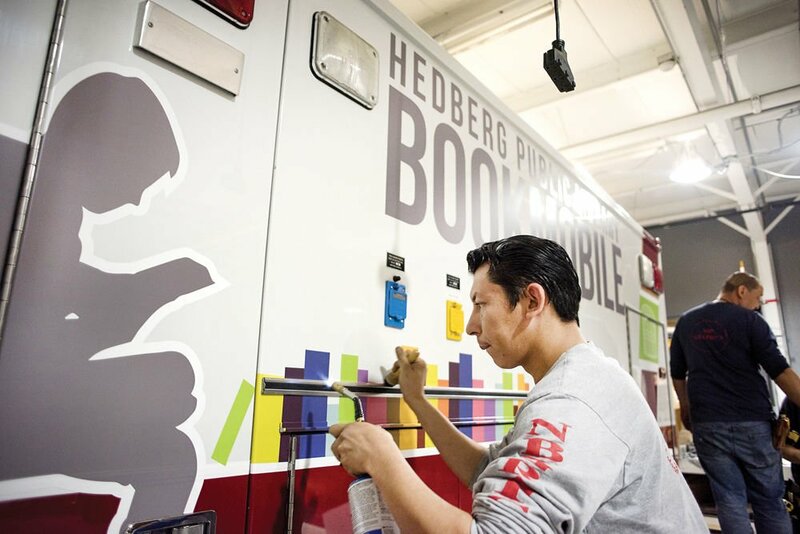 It might look like an ice cream truck as it drives through neighborhoods with flashing lights and music, but rather than selling cold treats, Hedberg Public Library's new bookmobile will serve up books. The bookmobile is the brainchild of a Rock County Leadership Development Academy team. The academy is a non-profit that attracts community members interested in becoming better leaders or growing professionally, said Kyle Mair, manager at accounting firm Baker Tilly Virchow Krause. The academy runs annually from September to May. "As part of the curriculum of the class, 19 of us this year split into teams," Mair said. "This team is five of us. Each team picks a project to either create something new or a project or program to help a current non-profit further their mission." Joining Mair on the team were Andrea Levine, outreach and communications coordinator at Beloit Public Library; Brent Sutherland, director of plant operations at St. Mary's Janesville Hospital; Jessica Grandt-Turke, principal at Harrison Elementary School; and Stephanie Pajerski, principal at Van Buren Elementary School. "We all did a personality exercise, and most all of us have completely different personalities," Sutherland said. "To pull all different personalities together and come up with a project together makes for a well-rounded group." The group learned the library wanted a bookmobile. "Hedberg Public Library has always wanted to do this but has never really had the funds or the means to get started," Mair said. "So at the beginning, we saw the biggest obstacle being getting the vehicle." The group found out the Janesville Fire Department had a decommissioned ambulance that was about to go to auction. "They were willing to donate it to our project, more so to the library as another arm of the city," Mair said. When asked about donating the vehicle, Janesville Fire Chief Randy Banker said he thought it was a great idea for the community. "I'm just glad we were able to be a part of it and be a part of the project," Banker said. "We're stewards of the community, so we try to give back when we can." The 1997 ambulance has 97,000 miles on it but needed only some electrical work and new brakes, he said. "We spent a lot of time getting the decals off," Sutherland joked. "There was a little bit of tweaking, but the for most part, it was ready to go." They worked with Janesville company Fetch Graphics put a new wrap put on the vehicle at a discount price. All 12 Janesville School District elementary schools held book drives and collected more than 1,000 books, Pajerski said. "All of those books will be donated, and they will be given out to students and don't have to be returned," Pajerski said. 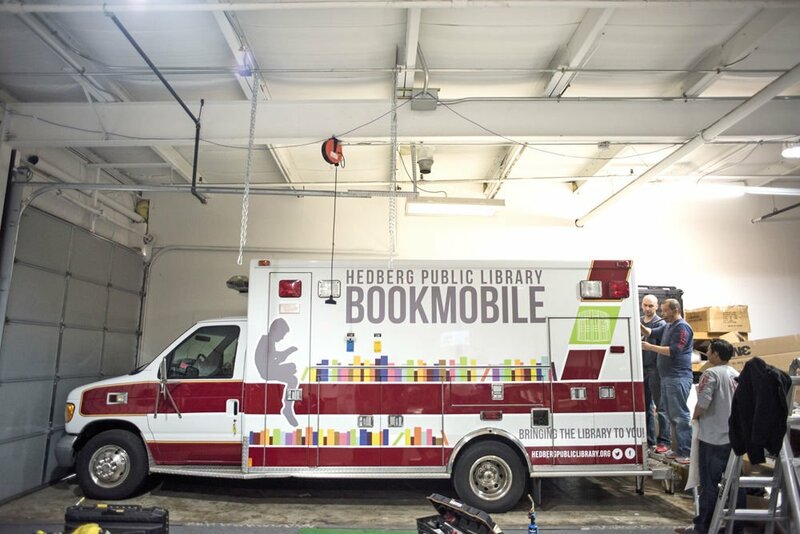 "Hedberg will also be putting some of their circulation into the bookmobile for checkout." Pajerski said the bookmobile will go to free lunch sites this summer and eventually drive a route through neighborhoods in the city. "We hope it's a motivator," Pajerski said. "They come for the free meal, and they'll also get some books." The bookmobile will give children reading options over the summer, she said. "When kids are off for the summer, they're not in those routines, they're not reading as regularly. For some kids, that's because they don't have access to books in their homes, so we saw this as a really great way to bring the books to the kids," Grandt-Turke said. "This is something the Hedberg Public Library has wanted to do for a while. It was on the wish list when we contacted them to see what their needs might be, and it was something that spoke to all of us," Grandt-Turke said. Mair said the group's fundraising goal was $5,000. Because the ambulance and a portion of the cost of the car wrap were donated, the group has been able to give the library $3,000 for vehicle maintenance, fuel and other things, he said. "The tagline is, 'Bringing the library to you,' and that's really been our goal," Grandt-Turke said.